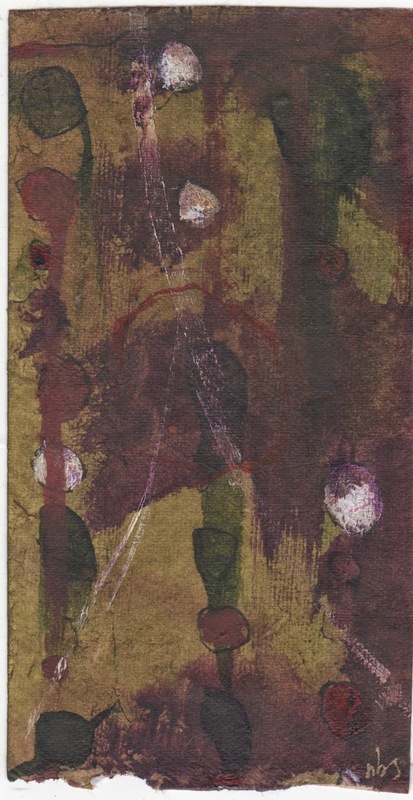 The Postal Ledger: Nancy Bell Scott vacates vacationland and is back to mail art! Nancy Bell Scott vacates vacationland and is back to mail art! I regret that my scanner hasn't picked up the nuance of this piece. Nancy uses the word 'murky' in reference to her first day back in the studio for months. I don't see it that way... Nancy has chosen a murky ochre as her ground but she plays with light in transparency, shiny surfaces and in movement with her brush in a way that feels light and playful inspite of itself. To me, Nancy has captured that feeling of making sense of something before you really understand it. Nancy tells me that she's relieved she's no longer in the 'hotbed of vacationland that is Orchard Beach'. It sounds like her new situation is great: on a quiet street and 5 minutes into the city! Still, when the Old Orchard Beach sign comes into view as we crawl up the highway into Maine, I'll probably imagine Nancy where I first wrote to her. whatever, it's great to have Nancy back in my mailbox! Love this piece...and the colors are super!